Provides enzymes known to decline with age. Used for slowing down or reversing premature greying of the hair. Offers real hope for extending life expectancy. This dietary supplement has been specifically formulated to offer a concentrate of catalase, an enzyme present in most living organisms and the subject of numerous scientific studies in recent years. Catalase has a significant anti-ageing effect, primarily helping to prevent hair from turning grey prematurely. Catalase supplement's efficacy may be linked to its very specific chemical composition. It is in fact a large protein formed from four identical chains of amino acids, each chain containing an atom of iron called a haem. This specific structure means that catalase can produce almost 200,000 catalytic reactions per second. It is thus considered one of the most active enzymes. 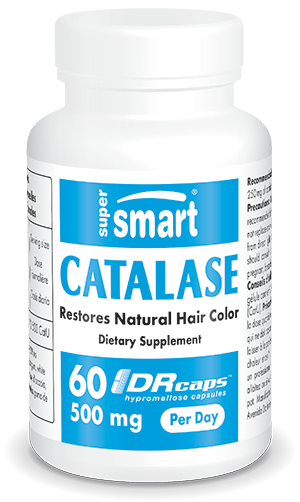 Catalase’s considerable activity has made it the subject of numerous scientific studies. Research suggests its beneficial effects may be linked to its iron content. The iron atom is able to break the oxygen-oxygen bond in hydrogen peroxide, a molecule harmful to healthy body function. This chemical reaction means that catalase reduces the accumulation of hydrogen peroxide in the body. Scientists have thus attributed catalase with protective effects that combat cellular ageing. In combatting premature ageing of the cells, catalase offers significant therapeutic potential. Its activity could potentially prevent the development of certain diseases, particularly those related to ageing. Hydrogen peroxide damage may be responsible for a number of health complications. By blocking this harmful molecule’s activity, catalase thus plays a key role within the body. For example, it protects the cell membrane structure and DNA against attacks from hydrogen peroxide. Some studies suggest it may also help protect and strengthen vital organs such as the heart. This protective role has led some scientists to describe it as the ‘longevity enzyme’. It could thus have many therapeutic applications, both in the prevention and treatment of certain diseases. Research is still ongoing to evaluate the extent of catalase’s potential. Some studies suggest that premature greying of the hair could be linked to a decline in catalase levels. Absence of this enzyme may enable hydrogen peroxide’s damaging effects to produce grey hairs. Hydrogen peroxide interferes with melanin, one of the main pigments in hair. By gradually destroying melanin, it leads to depigmentation, a process responsible for the appearance of grey and white hair. A number of scientists have investigated catalase supplementation as a way of preventing this process. Increasing catalase intake means the enzyme is able to reprise its protective role and, by dividing the hydrogen peroxide in two and thus blocking its activity, prevent the destruction of melanin. In combatting hydrogen peroxide’s oxidative damage, catalase is able to limit, slow down and even reverse the process whereby hair turns grey prematurely. On the basis of the many discoveries made about catalase, our supplement aims to counteract the signs of ageing naturally, simply and effectively. It has been designed to combat the premature cellular ageing which may be responsible for a number of health problems. Supplementing with catalase may also help prevent the appearance of grey hair. With all these anti-ageing effects, our supplement Catalase should form an integral part of any anti-ageing regime. A high quality product, our anti-ageing supplement is produced in the form of capsules, each one containing 250mg of catalase, equivalent to 6250 units of catalase activity. With this level of catalase, two capsules a day is the recommended dose, though this can be adapted to your needs and the advice of your therapist. To preserve the product’s efficacy, it should be stored in a cool, dry place away from direct sunlight. Other anti-ageing supplements that protect the body from premature ageing may also be of interest: Longevity Nutrients, DNA Repair and AMPK Booster. Other ingredients : HPMC (hydroxypropyl methylcellulose), microcrystalline cellulose, magnesium stearate, silicon dioxide. Each vegetarian capsule contains 250mg catalase, ie 6250 units of catalase activity (CatU). Store at temperature between 2 and 8 ° C in a dry place away from light.